ESET Smart Security 10.0.390.0 merupakan antivirus yang tentu saja merupakan salah satu antivirus terbaik hingga saat ini. ESET Smart Security ringan untuk digunakan dan bahkan kapasitasnya dibandingkan dengan Antivirus International lainnya, ESET Smart Security memiliki kapasitas yang cukup kecil dibandingkan yang lain, oleh karena itu sangat cocok digunakan oleh sahabat haramain software yang mempunyai laptop atau komputer yang standar namun menginginkan antivirus yang ringan dan terbukti sangat handal dalam membasmi virus baik ketika offline maupun sedang tersambung ke internet. Untuk sahabat haramain software yang masih menggunakan versi lama silahkan mengupdate ke versi terbarunya ini dan install pada windows yang digunakan baik itu windows vista, Windows 7, windows 8/8.1 maupun windows 10. 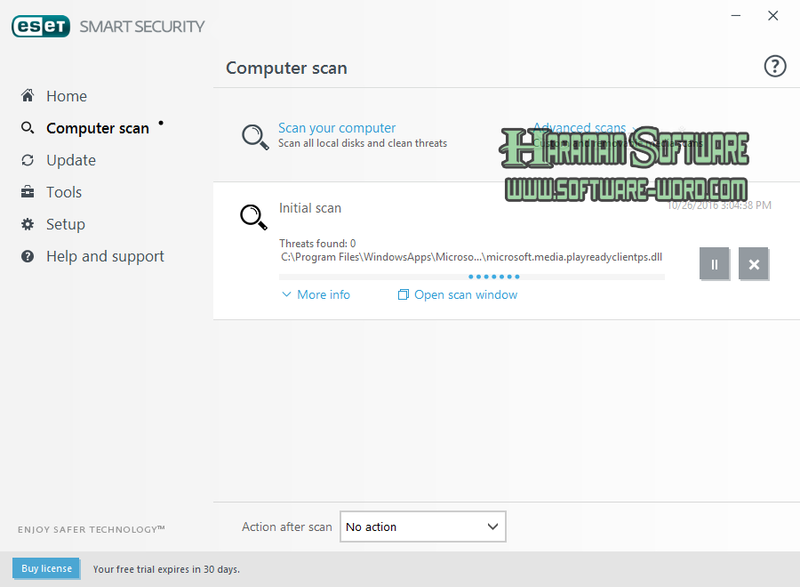 Pada postingan ini juga haramain software bagikan dengan Key Findernya untuk activasi ESET Smat Security 10.0.390.0. Smarter Scanner: Threats don’t always enter in ways you expect. ESET Smart Security inspects SSL-encrypted communication channels like HTTPS and POP3S, and intelligently scans compressed files to find threats that other products miss. ESET’s Smart Optimization feature makes file scanning faster than ever. Time-saving Firewall: New Learning Mode saves time by automatically creating firewall rules by observing how end users use the network, while offering advanced firewall modes for power users. Pair customized firewall profiles with trusted network zones and have appropriate firewall rules applied automatically based on detected network presence. Trusted Zone Authentication: Identify trusted network zones by network configurations (a configurable combination of host/DNS/DHCP server IP address, wireless SSID, connection profile, etc) or securely authenticate into a network using ESET Authentication Server. Upgraded Antispam: ESET Smart Security now takes care of annoying spam with a smaller, faster, and even more effective spam filter. Removable Media Security: Threats can enter your PC from removable media such as USB thumb drives. For self-running media, ESET Smart Security scans autorun.inf and associated files when the medium is inserted, in addition to scanning any file on any removable device when it is accessed, or during a full-scan of the media. System Tools: ESET SysInspector and ESET SysRescue simplify diagnosing and cleaning of infected systems by allowing deep scans of system processes to find hidden threats, and creating bootable rescue CD/DVD or USB drives to help you repair an infected computer. Self Defense: ESET Smart Security has built-in technology to prevent malicious software from corrupting or disabling it, so you can rest assured your system is always protected.